BMW i8 Roadster Review 2019 | What Car? As a general rule of thumb, mid-engined exotica and environmentally friendliness go together like a room full of lambs and a very hungry wolf. It is, however, possible to get yourself a flash set of wheels while giving the Earth a nice big hug – introducing the BMW i8 Roadster. This striking slice of futurism combines a dinky 1.5-litre three-cylinder engine with batteries and an electric motor. The result? Heart-pounding acceleration, with CO2 emissions of just 46g/km. Like the i8 Coupé, it has a super-stiff carbonfibre-reinforced plastic passenger compartment to ensure the car doesn’t behave like a microwaved lettuce leaf. 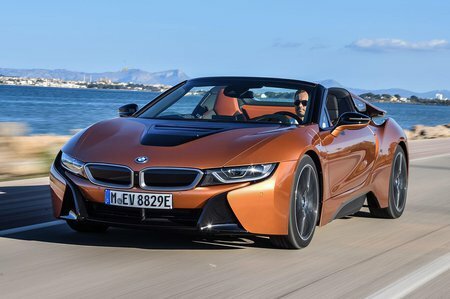 Despite the i8 Roadster’s tiny motor, it goes head to head with drop-top heavyweights such as the Audi R8 Spyder, Porsche 911 Cabriolet and Mercedes-AMG GT Roadster on price. While these may be quicker, you could argue that none of them has the i8’s visual clout. 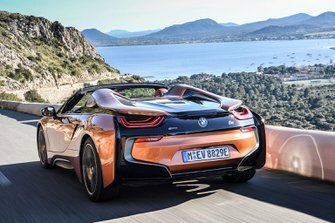 Over the next few pages, we’ll see exactly what the i8 Roadster brings to the luxury convertible market.